The 12.1" models had 10/100BT Ethernet, a mini-DVI port, a 64 MB NVIDIA GeForce FX Go5200, weighed 4.6 pounds, and had the following dimensions: 1.18" H x 10.9" W x 8.6" D. In addition, they had 256 MB of RAM soldered to the motherboard, no PC card slot, and a single RAM slot for expansion. The 17.1" model had 128 MB of VRAM and a dual-link DVI port (available as a BTO option on 15" model), weighed 6.9 pounds, and had the following dimensions: 1" H x 15.4" W x 10.2" D.
Announced on the last day of January in 2005, the PowerBook G4 (1.5-1.67 GHz, was essentially a speed-bump of the existing PowerBook G4 line, with modest feature improvements on the low and middle-end models. The PowerBook G4 shipped in five configurations. 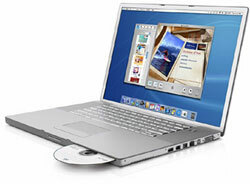 There were two 12.1" models, both with 1.5 GHz processors and 512 MB of RAM: the Combo Drive model, with a 60 GB hard drive, sold for $1,499 and the SuperDrive model, with an 80 GB hard drive, sold for $1,699. There were also two 15.1" models, both with 512 MB of RAM, an 80 GB hard drive and an illuminated keyboard: the 1.5 GHz Combo Drive model was $1,999; the SuperDrive model, with a 1.67 GHz processor, was $2,299. There was a single, high-end 17" model, with 512 MB of RAM, a 100 GB hard drive, twice the VRAM, a dual-link DVI port and a SuperDrive, for $2,699. 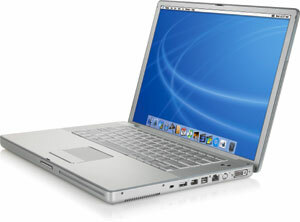 The 15.1" and 17" models were replaced by the PowerBook (Dual Layer SD) in October 2005. The 12.1" model was discontinued in May 2006; its form-factor was merged with the iBook line into the new intel-based MacBook models.